Whoa... That must have a street value of, like, a gajillion dollars! Did you ever hear this little ditty? Of the wiggle of her toes!" Re: Whoa... That must have a street value of, like, a gajillion dollars! No, never did...did it have a tune to go with? I'm a wimpy tenderfoot. Long story behind it, but still...not putting my bare pinkies in the snow, nuh-uh. And then (following ndozo's comment), there's always Popsicles Toes. I love the contrasts. 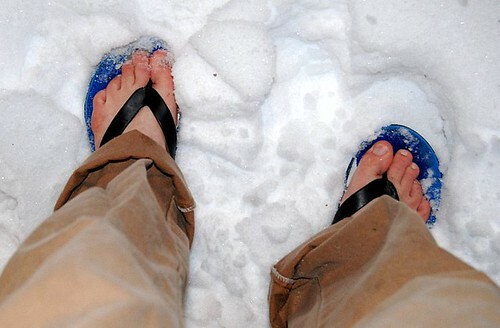 But I'm glad that your flipflops are blue and not your toes.